Lorna Chick has lived all her life on a farm at Wangandary, not far from Wangaratta in Victoria’s North East. She is mainly self-taught but did take art lessons in the 1960’s with Jock Tomlinson at Wangaratta Technical School. Daisies on Mount Buffalo, purchased by the Gallery in 1977, is typical of Lorna’s work and subject matter. The latter is generally inspired by her travels around the countryside, often in her younger days when she was in demand as a water diviner. Firmly planted in the naive school of painting, her flat panoramic landscapes are extraordinarily detailed. 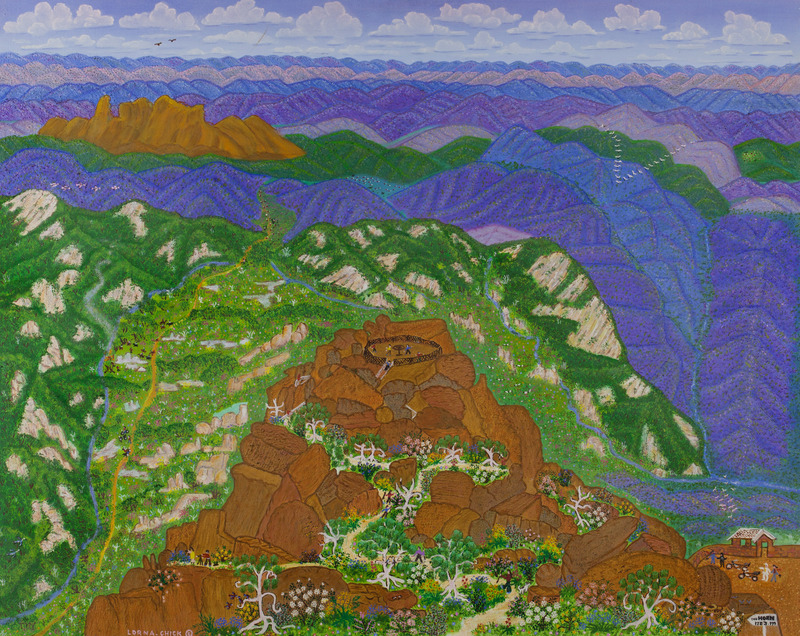 Note the people on the lookout at the top of Mt Buffalo in this painting. Five of her paintings have been purchased by the National Gallery in Canberra and four others hang in Parliament House, Canberra. She is also represented in the major regional galleries of Wangaratta and Shepparton.